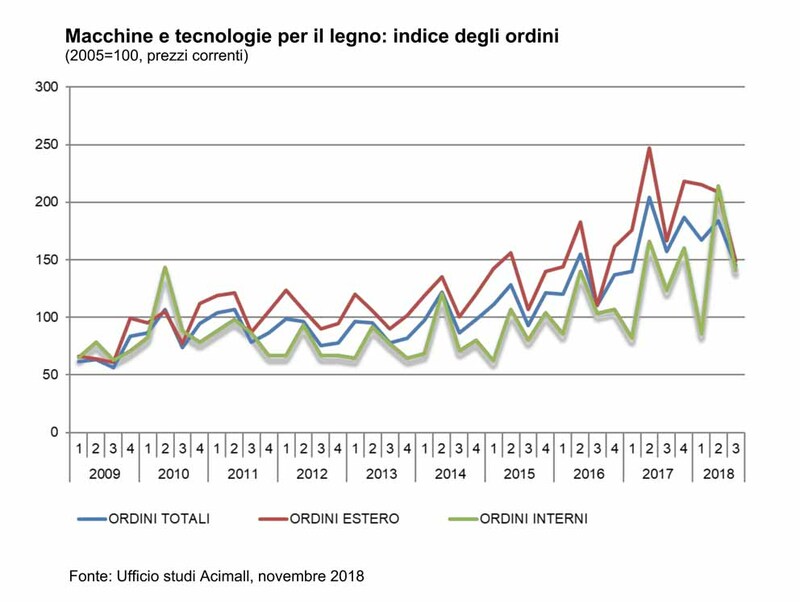 The results for the third quarter of 2018 drawn up by the Acimall Research Office, the Confindustria Association which represents the range of wood machinery and equipment, show a slight slowdown in orders overall, confirming the trend in the sector which, after a 2017 marked by strong growth, is undergoing a consolidation phase. However, Italian companies continue to show a certain vitality, with growth in orders on the domestic market of 14.7 percent higher than the figure for the same quarter of 2017. Unfortunately, orders from abroad show negative data, as they decreased by 10.9% in the period July-September of this year, always making a comparison with the same three months last year. Therefore, the orders for the third quarter of 2018 fell by 7.7 percent overall. It should be noted that, according to the Acimall surveys, third-quarter revenue grew 12.2 percent compared to the same period of 2017, thus confirming the positive state of health of the sector. The order book increased to 4 months (3.1 in the previous quarter and 3.4 in the January-March period), while prices from 1 January showed a growth of 0.5 percent (compared to 0.4 on June 30). However it can be noted that, from the results of the qualitative survey for the period July-September 2018, 44 percent of the interviewees indicate a positive production trend. The same percentage of entrepreneurs, on the other hand, reports a steady trend, while only 12 percent declare a contraction. Employment is stable for 61 percent of the sample, a slight decline compared to the previous quarter, while there are no changes in the number of those who value it rising (33 percent, same data for the period April-June); 6 percent unfortunately indicates a decline. Inventories are stable according to 61 per cent of the companies interviewed, down 22 per cent, up by 17. The sample offers some interesting indications on the forecasts for the near future: 17 percent of the interviewees are counting on an increase in foreign orders, while for 56 percent they will remain stationary; according to 27 percent foreign orders will record a further decline. The balance is considered negative, minus 10, against the 6th of April, and the 29th of the first three months of the year. Feelings that are substantially similar with regard to the Italian market: 67 percent of the sample believe the stability of orders was confirmed (they were 83 percent three months ago), while 27 percent indicate a decline (they were 11 percent in previous quarter). The balance is therefore negative, minus 21, and compares with the minus 5 of April-June and the 11th of January-March. Dario Corbetta, Acimall director, commenting on these data, highlighted how the uncertainty of the Italian political situation and the rejection of the Italian financial measures by the EU could influence the real economy of our country. "Nevertheless - said Corbetta - the Italian technology sector for wood and furniture is going through a positive season, although there are still large unsolved nodes in the background, first of all a company dimension that doesn’t too often allow prospects for development on the international scene".